A spring is a device that changes its shape in response to an external force, returning to its original shape when the force is removed. The energy expended in deforming the spring is stored in it and can be recovered when the spring returns to its original shape. Generally, the amount of the shape change is directly related to the amount of force exerted. If too large a force is applied, however, the spring will permanently deform and never return to its original shape. There are several types of springs. One of the most common consists of wire wound into a cylindrical or conical shape. An extension spring is a coiled spring whose coils normally touch each other; as a force is applied to stretch the spring, the coils separate. In contrast, a compression spring is a coiled spring with space between successive coils; when a force is applied to shorten the spring, the coils are pushed closer together. A third type of coiled spring, called a torsion spring, is designed so the applied force twists the coil into a tighter spiral. Common examples of torsion springs are found in clipboards and butterfly hair clips. Still another variation of coiled springs is the watch spring, which is coiled into a flat spiral rather than a cylinder or cone. One end of the spring is at the center of the spiral, and the other is at its outer edge. Some springs are fashioned without coils. The most common example is the leaf spring, which is shaped like a shallow arch; it is commonly used for automobile suspension systems. Another type is a disc spring, a washer-like device that is shaped like a truncated cone. Open-core cylinders of solid, elastic material can also act as springs. Non-coil springs generally function as compression springs. Very simple, non-coil springs have been used throughout history. Even a resilient tree branch can be used as a spring. More sophisticated spring devices date to the Bronze Age, when eyebrow tweezers were common in several cultures. During the third century B.C., Greek engineer Ctesibius of Alexandria developed a process for making "springy bronze" by increasing the proportion of tin in the copper alloy, casting the part, and hardening it with hammer blows. He attempted to use a combination of leaf springs to operate a military catapult, but they were not powerful enough. During the second century B.C., Philo of Byzantium, another catapult engineer, built a similar device, apparently with some success. Padlocks were widely used in the ancient Roman empire, and at least one type used bowed metal leaves to keep the devices closed until the leaves were compressed with keys. The next significant development in the history of springs came in the Middle Ages. A power saw devised by Villard de Honnecourt about 1250 used a water wheel to push the saw blade in one direction, simultaneously bending a pole; as the pole returned to its unbent state, it pulled the saw blade in the opposite direction. A diagram depicting spring coiling done by a CNC machine. In the eighteenth century, the Industrial Revolution spurred the development of mass-production techniques for making springs. During the 1780s, British locksmith Joseph Bramah used a spring winding machine in his factory. Apparently an adaptation of a lathe, the machine carried a reel of wire in place of a cutting head. Wire from the reel was wrapped around a rod secured in the lathe. The speed of the lead screw, which carried the reel parallel to the spinning rod, could be adjusted to vary the spacing of the spring's coils. Common examples of current spring usage range from tiny coils that support keys on cellular phone touchpads to enormous coils that support entire buildings and protect them from earthquake vibration. Various mathematical equations have been developed to describe the properties of springs, based on such factors as wire composition and size, spring coil diameter, the number of coils, and the amount of expected external force. These equations have been incorporated into computer software to simplify the design process. The following description focuses on the manufacture of steel-alloy, coiled springs. 1 Cold winding. Wire up to 0.75 in (18 mm) in diameter can be coiled at room temperature using one of two basic techniques. One consists of winding the wire around a shaft called an arbor or mandrel. This may be done on a dedicated spring-winding machine, a lathe, an electric hand drill with the mandrel secured in the chuck, or a winding machine operated by hand cranking. A guiding mechanism, such as the lead screw on a lathe, must be used to align the wire into the desired pitch (distance between successive coils) as it wraps around the mandrel. Alternatively, the wire may be coiled without a mandrel. This is generally done with a central navigation computer (CNC) machine. 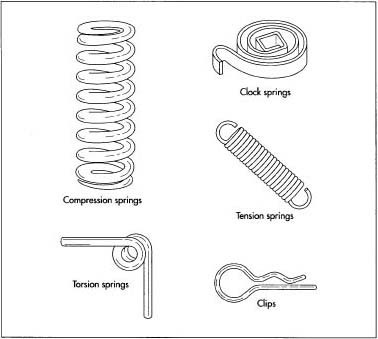 Examples of different types of springs. For extension or torsion springs, the ends are bent into the desired loops, hooks, or straight sections after the coiling operation is completed. 2 Hot winding. Thicker wire or bar stock can be coiled into springs if the metal is heated to make it flexible. Standard industrial coiling machines can handle steel bar up to 3 in (75 mm) in diameter, and custom springs have reportedly been made from bars as much as 6 in (150 mm) thick. The steel is coiled around a mandrel while red hot. Then it is immediately removed from the coiling machine and plunged into oil to cool it quickly and harden it. At this stage, the steel is too brittle to function as a spring, and it must subsequently be tempered. 3 Heat treating. Whether the steel has been coiled hot or cold, the process has created stress within the material. To relieve this stress and allow the steel to maintain its characteristic resilience, the spring must be tempered by heat treating it. The spring is heated in an oven, held at the appropriate temperature for a predetermined time, and then allowed to cool slowly. For example, a spring made of music wire is heated to 500°F (260°C) for one hour. 4 Grinding. If the design calls for flat ends on the spring, the ends are ground at this stage of the manufacturing process. The spring is mounted in a jig to ensure the correct orientation during grinding, and it is held against a rotating abrasive wheel until the desired degree of flatness is obtained. When highly automated equipment is used, the spring is held in a sleeve while both ends are ground simultaneously, first by coarse wheels and then by finer wheels. An appropriate fluid (water or an oil-based substance) may be used to cool the spring, lubricate the grinding wheel, and carry away particles during the grinding. 5 Shot peening. This process strengthens the steel to resist metal fatigue and cracking during its lifetime of repeated flexings. The entire surface of the spring is exposed to a barrage of tiny steel balls that hammer it smooth and compress the steel that lies just below the surface. 6 Setting. To permanently fix the desired length and pitch of the spring, it is fully compressed so that all the coils touch each other. Some manufacturers repeat this process several times. 7 Coating. To prevent corrosion, the entire surface of the spring is protected by painting it, dipping it in liquid rubber, or plating it with another metal such as zinc or chromium. One process, called mechanical plating, involves tumbling the spring in a container with metallic powder, water, accelerant chemicals, and tiny glass beads that pound the metallic powder onto the spring surface. Alternatively, in electroplating, the spring is immersed in an electrically conductive liquid that will corrode the plating metal but not the spring. A negative electrical charge is applied to the spring. Also immersed in the liquid is a supply of the plating metal, and it is given a positive electrical charge. As the plating metal dissolves in the liquid, it releases positively charged molecules that are attracted to the negatively charged spring, where they bond chemically. Electroplating makes carbon steel springs brittle, so shortly after plating (less than four hours) they must be baked at 325-375°F (160-190°C) for four hours to counteract the embrittlement. 8 Packaging. Desired quantities of springs may simply be bulk packaged in boxes or plastic bags. However, other forms of packaging have been developed to minimize damage or tangling of springs. For example, they may be individually bagged, strung onto wires or rods, enclosed in tubes, or affixed to sticky paper. Various testing devices are used to check completed springs for compliance with specifications. The testing devices measure such properties as the hardness of the metal and the amount of the spring's deformation under a known force. Springs that do not meet the specifications are discarded. Statistical analysis of the test results can help manufacturers identify production problems and improve processes so fewer defective springs are produced. Approximately one-third of defective springs result from production problems. The other two-thirds are caused by deficiencies in the wire used to form the springs. In 1998, researchers reported the development of a wire coilability test (called FRACMAT) that could screen out inadequate wire prior to manufacturing springs. Computer-operated coiling machines improve quality in two ways. First, they control the diameter and pitch of the spring more precisely than manual operations can. Second, through the use of piezoelectric materials, whose size varies with electrical input, CNC coiling heads can precisely adjust in real time to measurements of spring characteristics. As a result, these intelligent machines produce fewer springs that must be rejected for not meeting specifications. Demands of the rapidly growing computer and cellular phone industries are pushing spring manufacturers to develop reliable, cost-effective techniques for making very small springs. Springs that support keys on touchpads and keyboards are important, but there are less apparent applications as well. For instance, a manufacturer of test equipment used in semiconductor production has developed a microspring contact technology. Thousands of tiny springs, only 40 mils (0.040 in or 1 mm) high, are bonded to individual contact points of a semiconductor wafer. When this wafer is pressed against a test instrument, the springs compress, establishing highly reliable electrical connections. Medical devices also use very small springs. A coiled spring has been developed for use in the insertion end of a catheter or an endoscope. Made of wire 0.0012 in (30 micrometers or 0.030 mm) in diameter, the spring is 0.0036 in (0.092 mm) thick—about the same as a human hair. The Japanese company that developed this spring is attempting to make it even smaller. The ultimate miniaturization accomplished so far was accomplished in 1997 by an Austrian chemist named Bernard Krautler. He built a molecular spring by stringing 12 carbon atoms together and attaching a vitamin B12 molecule to each end of the chain by means of a cobalt atom. In the relaxed state the chain has a zigzag shape; when it is wetted with water, however, it kinks tightly together. Adding cyclodextrin causes the chain to return to its relaxed state. No practical application of this spring has yet been found, but research continues. "Coil Spring Making Process—Automotive." Industrial Engineers and Spring Makers. http://www.ozemail.com (November 2000). "H & R Spring Overview." http://www.hrsprings.com/abouthr.html (November 2000). Silberstein, Dave. "How to Make Springs." http://home.earthlink.net/-bazillion/intro.html (November 2000). Thanks for the well written introduction to springs. However, a CNC machine is a Computer Numerical Control machine, not "central navigation computer" machine. Please fix that. A basic error like that makes us doubt the accuracy of the rest of this article.